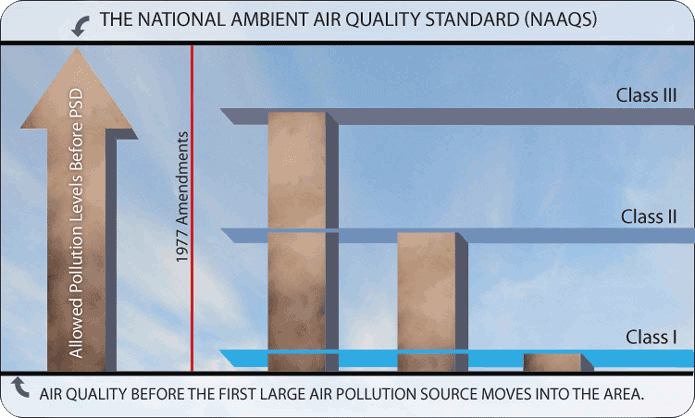 The Clean Air Act includes the Prevention of Significant Deterioration (PSD) program. The PSD program established designations for air quality throughout the country – Class I, Class II and Class III. Each class allows increased pollutant concentrations, called PSD Increments [40 CFR 52.21(c)] as you move from Class I to Class III, but none are allowed to exceed the NAAQS. The entire country was designated as Class II, while 158 national parks and wilderness areas were designated as Class I if they met a specific set of criteria. These areas are known as “Mandatory” Class I areas. States and tribes have the ability to request redesignation from Class II to Class I called a “Non-federal“ Class I areas. While there are no states that have requested Class I redesignation, five tribal reservations have been redesignated to Class I, including the Forest County Potawatomi Community. The PSD program established “increments” – a maximum allowable increase in the concentration of a pollutant (measured in micrograms per cubic meter -µg/m3) above “baseline”, or the level of air quality before the first large air pollution source moved into the area. It is important to note that the increments do not apply to all pollutants, but only to sulfur dioxide, nitrogen dioxide and particulate pollutants. 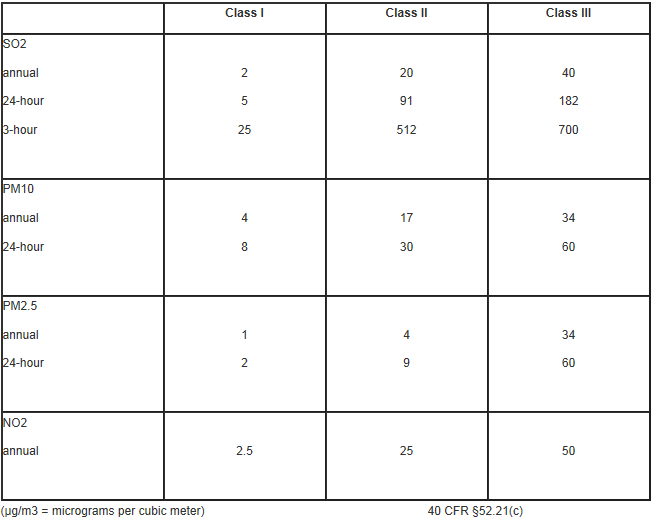 Class I areas provide smaller pollution increments and protection of Air Quality Related Values (AQRVs). Under Class I, the extent of the smaller Class I increment extends 62 miles (100 km) out from the Class I area boundary. 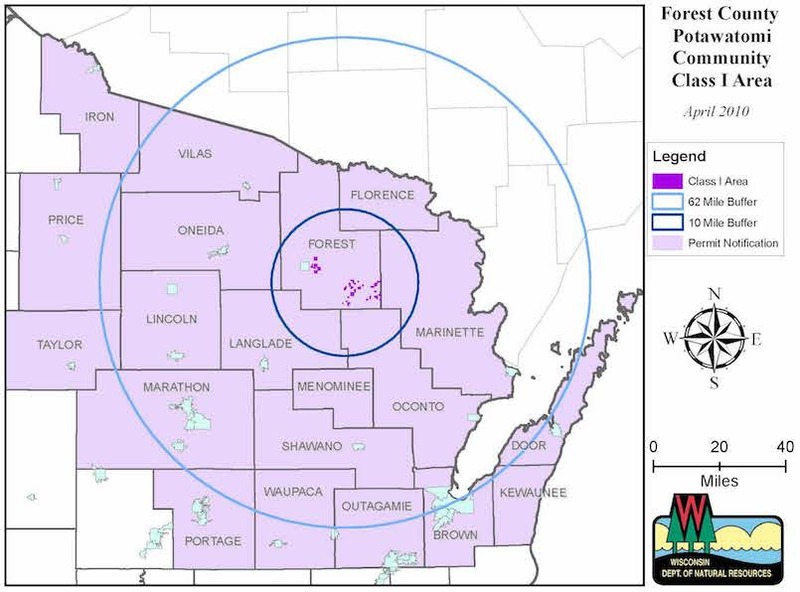 In the 1999 Class I Final Agreement between the FCPC and the Wisconsin DNR, with respect to reduced increment associated with sources located in Wisconsin, the Tribe agreed to a reduced area extending only 10 miles beyond the outermost boundaries of the Tribe’s designated Class I area. This reduced increment does not apply to the State of Michigan however, and increment applies to counties within the upper peninsula of Michigan. See map below. Natural and/or cultural resources that hold value to FCPC and that may be altered and/or damaged by degraded air quality are called Air Quality Related Values. Anything from plants, soil, aquatic systems and visibility can be considered an AQRV. Buildings or stone monuments – particularly those of historic value and/or made from limestone that is dissolved by rain that is acidic (high pH), can also be an AQRV. While mandatory Class I areas are required to identify AQRVs within the Class I area, tribal Class I areas are not. It is and advantage of Class I designation however, because the pollutant thresholds associated with AQRVs can be more protective than the NAAQS and Class I increment.T. The FCPC listed “Aquatic Systems” and “Water Quality” as AQRVs in its 1999 Class I Agreement with the State of Wisconsin. In the “Agreement”, the Tribe is able to make changes to the AQRVs and related thresholds every 10 years if there is a need to. 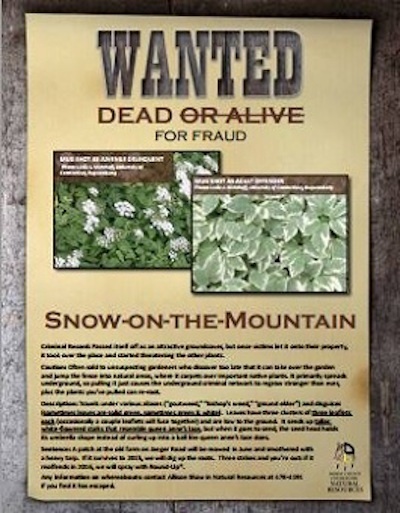 However, it may add an AQRV within the 10 year period if the Tribe believes that “substantial harm” will occur to a resource on the reservation. An AQRV analysis is conducted as part of the air pollution application process to determine if the source has the potential of impacting an AQRV. Pollution control measures can be implemented to eliminate the impact if one has been determined. On August 3, 2011, FCPC added “Visibility” and “Vegetation” to its existing “Aquatic Systems” and “Water Quality” AQRVs through Executive Council Resolution. On June 13, 2012, FCPC submitted in a letter to the Wisconsin Department of Natural Resources (WDNR) for review, scientific reports supporting the AQRVs, Water Quality and Aquatic Systems, Visibility, and Vegetation, and establishing the respective Threshold Effects Levels (TELs) . WDNR’s review concluded April 29, 2015 with support of the AQRVs and revised TELs. The Forest County Potawatomi Community submitted a letter to the USEPA in December 1993 advising that the Tribe was pursuing Class I Designation. The following year, the Tribe worked on the required Class I Redesignation Technical Report that described the effects of the proposed redesignation on the health, environmental, economic, social, and energy segments of the area and provided it for review by the public and the USEPA. In that same period, notices were given to the states of Wisconsin and Michigan as both would be effect by the Class I and public hearings were held in conjunction with a public comment period. By June 1995, the USEPA had determined that the FCPC had met the procedural requirements of redesignation. The states of Wisconsin and Michigan objected to USEPA’s proposed redesignation of FCPC’s Reservation and asked that the USEPA initiate the dispute resolution process. The state of Wisconsin and the Forest County Potawatomi worked on resolving the dispute through the development of an agreement that included big concessions on both sides. 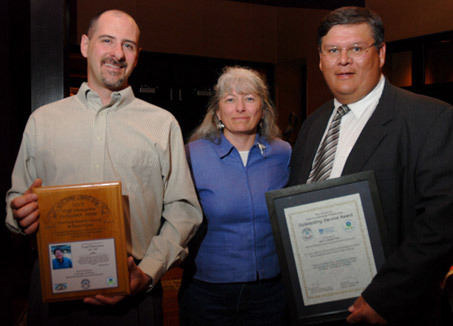 By September of 1999, Wisconsin and FCPC signed the Class I Final Agreement that was then recognized by the U.S. Environmental Protection Agency. Meanwhile, when Michigan and FCPC attempted to resolve Michigan’s dispute over the proposed Class I designation, the parties were unable to come to any agreement. In 2004, FCPC requested that the USEPA resolve the dispute and grant the Tribe Class I redesignation. Progress on the redesignation moved slowly, and in 2006, the Tribe filed notice of intent to litigate resulting from “Unreasonable Delayed Action” with the USEPA. 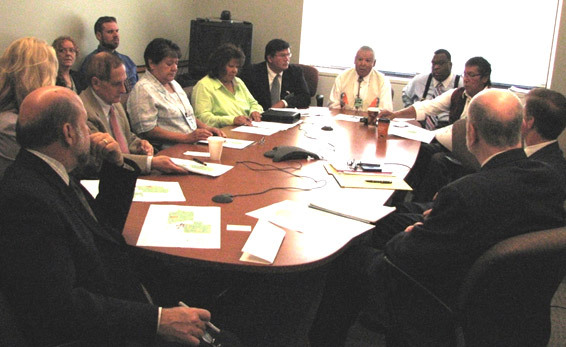 In June of 2007 the FCPC Executive Council met with the USEPA Administrator in Washington D.C. to get a status report and reaffirm it’s reasons for requesting Class I redesignation. And finally in April of 2008, 14 years after submitting it’s letter of application to the USEPA, the Tribe received redesignation in the Final Rule-making published in the Federal Register. In conjunction with FCPC’s Class I Redesignation, the disputeresolutions with the States of Wisconsin and Michigan were published in the Federal Register, approving the 1999 Class I Agreement between Wisconsin and FCPC that included the concessions, and applying full Class I protections for the Tribe to the state of Michigan. The state of Michigan filed an appeal with the 7th Circuit Court; however, the appeals court rejected the State’s request on September 9th, 2009.